I’m so happy to see that people are becoming so much more aware of the sugar in their diets, and the impact it has on their health. The term “blood sugar” is now common in conversation and most of us are happy to learn of ways to control the fluctuations that may result in metabolic syndrome, diabetes, or other inflammatory conditions like cardiovascular issues. Obviously eliminating the processed high carb, high sugar offerings is key. Exercise is also an integral piece. I’m not talking about Olympic endurance training. Simple movement like walking on a regular basis will be extremely supportive of your entire well being. And personally I really enjoy the concept of food as my medicine. Here are some foods that research has found to have blood stabilizing effects on your day. 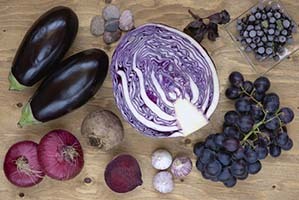 Anthocyanins are naturally occurring plant pigments found in red, purple and blue fruits and vegetables. In addition to balancing blood sugar and decreasing inflammation, they also have exhibited protective actions for the cells of the pancreas. So next time you enjoy berries, eggplant, black currants, red cabbage or dark beans you’re doing your blood sugar a big favor. Apple cider vinegar slows down actions of your stomach and increases efficient utilization of glucose. It also has a positive effect on enzyme activity. If you are concerned about the possibility of type 2 diabetes, consuming apple cider vinegar at bedtime may help lower your next morning fasting glucose level. Fiber, a personal favorite of mine, is a true friend to blood sugar balance. In short, fiber absorbs and dilutes the digestion process of carbohydrates and has demonstrated a decrease in post-meal blood sugar readings by an average of 20 percent. Populations in other countries that consume large amounts of fiber are virtually free of bowel diseases. Both types of fiber, soluble and insoluble, are found to be helpful, so please be generous with those leafy greens, legumes, low-glycemic fruits, chia, hemp, ground flaxseed and psyllium and even some quality whole grains. Your blood sugar, and your overall digestion will appreciate it. Chromium is a micromineral that is critical for sugar metabolism, and is widely available in supplement form. However it’s nice to know that you can find chromium in broccoli, organic eggs, barley, oats, green beans, onions, and nuts, so chromium can be delicious too. This last suggestion may not be supported as conclusively by research as by traditions, and I’ll offer, enjoyment. Although there have been studies linking cinnamon with lower fasting blood glucose, it seems the effects are not long-lasting. Adding cinnamon to your steel cut oatmeal may directly help to balance your blood sugar for that meal, but you better keep the cinnamon shaker around for lunch and dinner as well. In my experience, when cinnamon is added, many times it seems to satisfy my craving for something sweet. Have you noticed that too? So in a round-about way, that’s sugar control. I hope these simple “food as medicine” suggestions will serve helpful on your own path to balanced blood sugar and excellent digestive health.